Having taken up photography as a hobby, I got Adobe Lightroom installed on my Mac and had the time to try out some RAW files developing using the software. First impressions was the usability of the software for some intermediate edits on lighting. Indeed, Lightroom sure makes me appreciate the importance of lighting on a photo. I have started on using it for some old photos which I scanned and the dust spot correction proves to be useful. Some past photos which I took that was lacking in the exposure department and the colours department was easily edited to bring out better pictures. 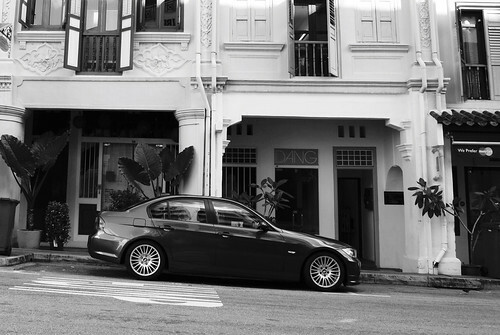 Personally, I like this one I took some time back with the shophouses along Club Street as the background. As I am still a beginner at this, results might not be spectacular, but it is a start of the journey for better images. More images of the car can be found at my flickr site and hopefully I could put up more images worth showing at this site.